Good news for old-media sufferers! 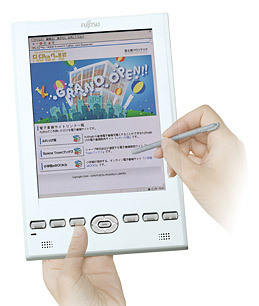 On Wednesday, Fujitsu announced the world’s first color e-reader. It renders text as cleanly as a printed page, displays 260,000 colors, weighs three-quarters of a pound and is connected to the Net via WiFi. It costs $1,000, a price tag that’s probably three times too high, which is typical for products aimed at early adopters. Still, I think the Fujitsu “FLEPia” brings us  the people who make magazines, newspapers, books, TV shows and movies  one step closer to fixing our badly broken business model. Once we’ve got the All-Media Device, we’re back in business. In the meantime, the migration from the Web to the post-Web world  where content is easier to consume on new mobile devices, but no longer free  is fully underway. I love the Web, of course, and fully expect it to continue as the free repository of all information. As a Database of Everything, it is the crowning achievement of civilization. And I absolutely believe that it’s possible for certain kinds of low-overhead content producers to eke out a living here, attracting enough audience to generate modest ad revenue. So far, this has worked best for curators, scavengers and commentators  the three pillars of the Temple of Blog  and others who purvey short-form stuff. But the Web, via computer, offers a lousy deep-reading experience. The Web has too many distractions in the form of links, e-mails, instant messages and now Twitters. Besides, if a device has a real keyboard, it’s for “writing,” not reading  the user is primed more for output than input. Amazon was the first to exploit that weakness and is building a billion-dollar business built around a gadget aimed at people who read offline. In fact, it has already supposedly sold more than 500,000 of its $359 e-readers, despite their obvious limitations. The Kindle was the first baby step toward the post-Web world. The FLEPia, and its descendents, is another. The march is picking up speed: The iPhone is a terrific example of a post-Web device. Yes, you can use it to browse the Web, but it works so much better via the native iPhone applications that you download to it. On Tuesday, Apple unveiled a number of improvements to its mobile operating system, which will only hasten old media’s move to the post-Web world. The biggest change: Apple’s app store will let us charge subscriptions for our content. And now, with a rumored 9-inch iPod Touch heading to consumers  an Apple iReader! Linked to Apple’s one-click-to-pay App store!  I bet great magazines and newspapers will come up with iterations that you actually will pay for. Once people own gorgeous gadgets, they want to augment them with content. The iPhone and Kindle proved that. Hearst is so convinced this is the way to go, it’s building its own device and online newsstand-store. The problem with his analysis is, I’ve already gone through the Depression stage. And yet I believe more than ever that the patient can be saved. Could ‘Reader’ controversy hurt Oscar chances?